Miharashi-tei is located by Lake Kawaguchi. Enjoy its view through our large windows. 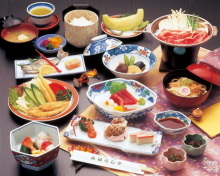 Japan is a country of beautiful scenery and delicious food as well as long history and tradition. Among many wonderful features, it is the magnificence of Mount Fuji that often wins the highest praise from foreign visitors. Mt. Fuji is surrounded by five beautiful lakes. One of them is Lake Kawaguchi which attracts many visitors. Miharashi-tei is located on its lakeside. Established in 1921, it is the oldest restaurant in this area. We offer excellent Japanese cuisine made with finest ingredients, Inden, local wines, and Japanese folk crafts. We hope to make your visit to Lake Kawaguchi and Miharashi-tei a very memorable experience. Please stop by during your trip to Mt. Fuji. We look forward to serving you. Our excellent chef creates wonderful dishes while surrounded by the beauty of Lake Kawaguchi and Mt. Fuji. In our exquisite local cuisine, classic Japanese set menu, meat, fish, etc., the flavor of every ingredient is heightened to the full effect. In “Koshu”, as Yamamashi was called in the old days, rice did not grow well because of its rather sterile soil with a lot of lava from Mt. Fuji in the base. So people used to eat “hoto”, wheat noodle soup with miso and vegetables, three times a day. Enjoy the local taste full of ancient wisdom and history. Nabe set. Please ask for details. One of the most popular Japanese classics, sukiyaki is a flavorful, rich meal with beef and vegetables cooked in the traditional combination of soy sauce, sugar, and mirin. 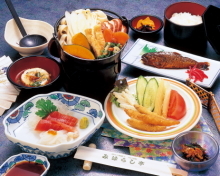 Other side dishes accompany this set meal so that you can enjoy various flavors of Japan. 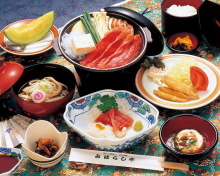 ※ There are three types of Sukiyaki set. Our hot plate is made of Mt. Fuji’s yogan, or lava rocks. Its far-infrared heating cooks meat to be tender and delicious. 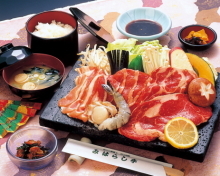 We offer “BBQ-style meat” and “wagyu beef steak” cooked on the lava hot plate. Wagyu, or Japanese cattle, is very tender and flavorful; it is the beef of highest quality. Yogan Yaki. Please ask for details. Special. Please ask for details. · Shinjuku – 56 min. on Chuou Honsen Ltd. Express – Otsuki – 40 min.